The Castro de Baroña is a primitive settlement that dates back to the 1st Century BC to the 1st Century AD. 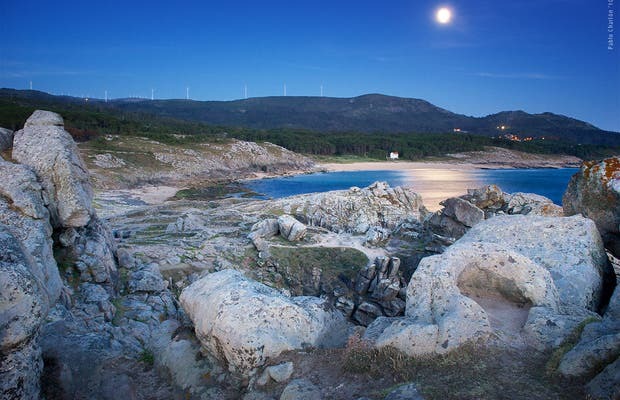 It is located in Baroña, municipality of Porto do Son in La Coruña. It is considered to be one of the best kept forts in Galicia, next to the ones in Monte Santa Tecla (A Guarda) and they are next to the sea over a small peninsula, contrary to the ones of Citania de Santa Tegra located in the mount with the same name in the municipality of A Guarda (Pontevedra). It is believed that the town of Baroña was self-sufficient, inside the fort there is no water, so they must have had to look for it outside They think that the food was based on the sea: seafood and fish. There are metallurgy remains, stone and textiles. I had heard that it was one of the most beautiful places in Galicia, and now that I’ve been there I can say it’s true. It is one of those places that transports you back in time and makes you feel part of that world. It is easily accessible, there is a sign on the road and you can leave your car next to the restaurant. You then have to walk about 500 meters, on a path full of pine trees. I recommend this visit to everyone, it is also a good plan for children, without strollers. For me, this is a very special place for numerous reasons…there are pine trees on both sides of the path that takes you to the fort. The atmosphere is very peaceful, hippies, couples, groups of friends and a few dogs. In the foggy nights it is incredible to hear the rounds of the lighthouse of Ribeira. Up, next to the road, there is a bar, “Os Castros” where you can eat well for a good price (unless you order from the menu) and with a great service; José is now an old friend. More reasons: being able to see the susnset from the cliffs; south, behind the small cove next to the forts there is a nudist beach where you can enjoy the sun and the sea, although the sea is very rough here. This beach, in july, you can see at sunset families of dolphins playing close to the shore.